Two goals and and two injuries in the first frame couldn’t stop the No. 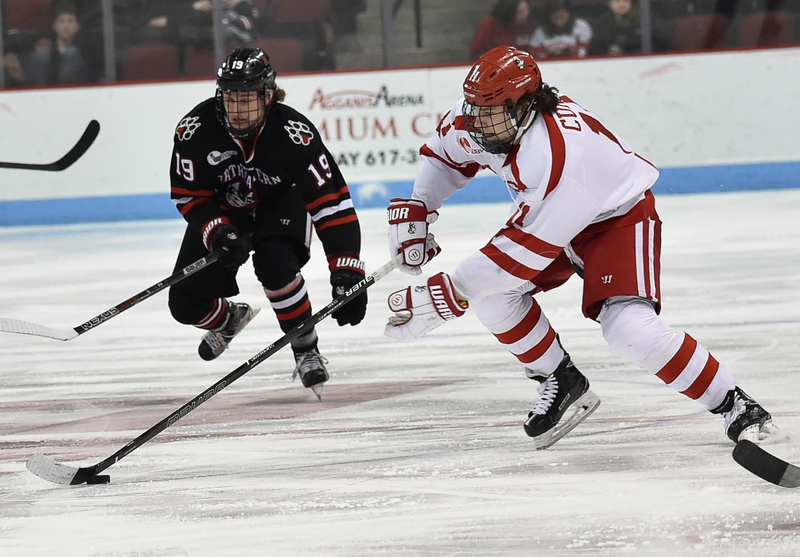 8 Boston University men’s hockey team from earning the 3-2 win against Northeastern University on Friday night. For the seventh consecutive game, the Terriers (22-10-3) allowed their opponent to score the first goal. All those goals were allowed in the first period, and in those seven games they are 3-3-1. It looked like the Terriers were heading down a slippery slope, but they completed the comeback and won in an overtime battle. BU head coach David Quinn said his team’s ability to play from behind says shows his team knows how to play in “crunch time.” He was also impressed with how the players handled the loss of two teammates to injury. The Huskies (18-14-5) got on the board just over seven minutes into the matchup with a goal from the hands of senior Zach Aston-Reese. The winger, who is the top scorer in college hockey with 31 goals, started digging the hole that the Terriers would fight to fill as the night went on. Two and half minutes later, forward Dylan Sikura made the hole deeper when he netted his 21st of the season to put the Huskies up 2-0. The Terriers are 5-4-2 when trailing after the first, and 3-0-1 when giving up two goals, so they had no reason to believe they were out of the game. Sophomore forward Jordan Greenway said his team doesn’t lose much confidence when playing from behind. Another setback for the boys in scarlet and white was the loss of Carpenter. The first line winger was hit hard in the corner just past the halfway point of the first period. He took some time to get up, dropped his stick on the way to the bench and walked down the tunnel with some assistance. Carpenter is the third leading scorer on the Terriers with 30 points. He started the game alongside freshman forwards Clayton Keller and Patrick Harper on the top line. Junior defender John MacLeod also didn’t return to the bench after the first period. Quinn said it’s still too soon to say what their status is. Following their departures, all lines and pairings were mismatched, which didn’t seem to cause the team much trouble. 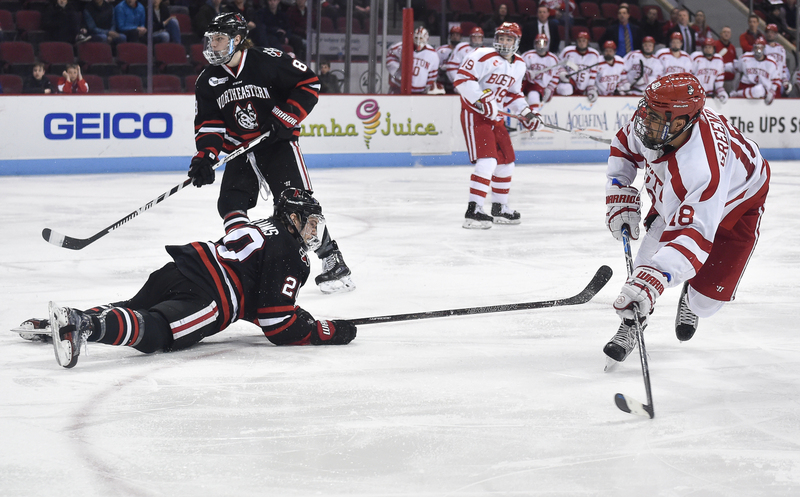 Freshman defender Dante Fabbro, who netted the Terriers first goal in the second period, said he thought his team handled the sudden changes well. Fabbro didn’t seem phased at all by the changes, as he notched the Terriers first goal 7:33 into the second period. Junior forward Chase Phelps scored the game-tying goal 9:28 into the third to send the game to overtime. The Terriers climbed all the way out of the hole and planted the victory flag on the ground just 3:11 into overtime. Keller fed the puck to Greenway, who scored his first goal since Feb. 17 in a game against the University of New Hampshire. With the comeback, the Terriers took game one. The teams will face off again on Saturday for game two, and Quinn is hoping his team can carry their momentum.